everything LEB: Presents for everyone!! I have a ton of birthdays to remember and I hate being that friend that forgets, oops! 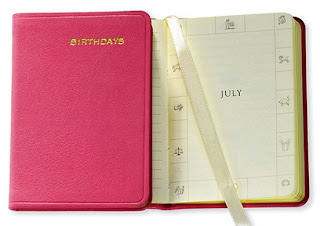 This little birthday book is so great to keep on your desk to keep those important birthday dates top of mind. Love this little photo brag book. Its the perfect present for someone who just had a baby, got a new pet, or is just married or engaged. Everyone always asks to see pictures of those events, so now you can carry them stylishly. I carry a notebook with me at all times. Its really handy to keep track of all those to-do lists, great decorating ideas, or just general doodles. These leather covered ones are so much prettier than my nasty stack of scrap paper stapled together and sure to be a pretty addition to your bag or desk too. 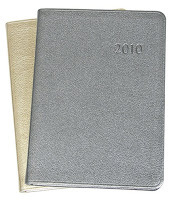 Love those leather journal too- well now this beautiful blue one can be yours to win! If you want another entry, post about this great giveaway on your blog and leave me a second comment telling me you did. You have till Thursday midnight (2/11) to enter!! Go now, go and spread the good news to everyone. AND for those of you who don't win the blue journal you still win too!! Just use the code FEBSALELEB for free shipping on any of the lovely products they have. Go to Graphic Image to see everything. *again dont forget Valentine's Day presents...any one of the above items would surely be loved! What a fun giveaway! Love the color of that journal. I would take the birthday reminder book, too. You can always use one of those! Love the journal. It would be great to have one of those for my work notes! Right now I've got about 3 different notepads floating around & I get made fun of constantly. - It'd be good to consolidate in a stylish way! That color is sooo pretty. I really want one of those little brag books to show off brand new pictures of my kiddos. I love the aqua blue color! Love the blue journal. It would be perfect to carry around and keep myself organized! (Plus, my clients may think I'm stylish too.) Great giveaway! Graphic Image has such quality products with a focus on great design! I love their locket heart journal, too. 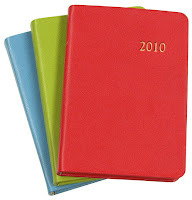 These are very cute, I've already started my "work date book"...I could always use a personal one. Love the journal... perfect for my delayed New Years resolution! LOVE a pretty journal. I like that one a lot. Hook me UP! Oh...I do LOVE a notebook! Please pick me! What a pretty (and dare I say almost Tiffany like) blue...Super cute and a great giveaway...Thanks! but i like the thought! Great giveaway. I, too, always keep a notebook in my purse to keep up with lists and to dos. I go through them pretty quickly! That leather journal is the perfect shade of blue! 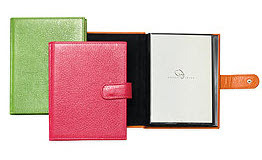 My other Graphic Image fav is the Brights Leather Desk Diary...I want it in orange and free shipping makes it even better. Thanks! My favorite color! I would use it to start the daily journal I have always dreamed of writing, but have yet to commit to. I just found your blog about a week ago, and I am really enjoying it. ohhh that baby blue is TDF!! It is MY color! What a fantastic giveaway! Thanks for the opportunity! LOVE the blog! 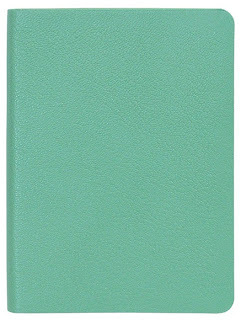 one turquoise leather journal, pretty please! what a great giveaway! pick me! I will sew with you! Love little notebooks! And that color! Love the color and I dream of being organized. What a great gift and a beautiful journal. Makes me want to start journaling again! Fun giveaway Linds! I also jot down things all the time but just have pieces of paper in my purse. need to get one of these! 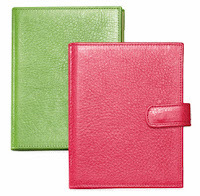 And if I had to pick between all their fabulous planners I would go with the lime colored one next to this blue one! Oh I love, love, love it!!! And the color is beautiful!! Thanks for a great giveaway. Sweet - count me in please! These are gorgeous! I have been so delinquent in buying my 2010 datebook and have crazy slips of paper with dates and times all over the inside of my bag. Ugh. I love this stuff. I would buy 10 planners a year if it wasn't such a waste! ooh good to know! Have to check out that little golf book! That color is amazing, a perfect pick-me-up for this dreary weather! I am obsessed with organization, and still I prefer to write everything down instead of using the computer. I would probably use this to jot down blogging ideas and writing inspirations. I also love the blotters on the site, especially the one with the red. Perfect for brightening up a desk. I almost missed entering! I can't believe I forgot to leave a comment. 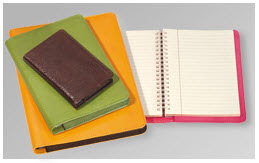 I need one of these to keep all of my blogging ideas in one place...other than the blue one (of course) I love the pink notebook and the croc-embossed notebooks. Oh loving that notebook. I tend to carry them in my purse to jot down client notes of topics for blog posts so I would put it to good use! I love that!! The shade of blue is perfect! That journal is lovely! I just love that shade of blue. What a wonderful giveaway! 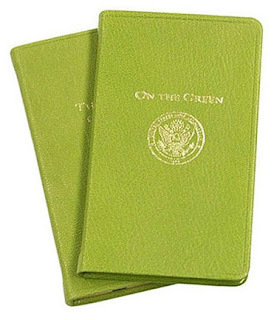 Those are gorgeous - I think I need one of those lovely passport covers - I've always wanted one! I love your blog, and mentioned it and the contest on my own blog, here! Check it out! Lovely noteboook! I would use it as my new sketch pad! love the notebook. would use it for phone messages. great giveaway!!! Love them all but could use the passport cover. Fun givaway! Agreed, what a fun give away! What a great giveaway! I would use it to organize my to-do lists, I love making lists, but end up with lots of random pieces of paper! I have yet to start a new planner for the year...this would make it a great late start! love it. I could use this to jot down my random ideas/lists...no better perk-me-up than a pretty little notebook, especially for such drugery as grocery lists!! pretty pretty! what a great giveaway girl! i always need lovely things to organize myself. hehe. Wow these are pretty. I was just thinking I need a little help in the organization department, this be the help I need! What a wonderful way to cheerfully take notes. I love all of the bright colors (especially with this winter we are having). I have to admit I would love to win (so much that this is the first time I have ever commented on anyone's blog). Thank you for the lovely contest! Great giveaway! Love the colors!